Dawnguard Novice Hakar is a Nord bandit and a novice vampire hunter who appears as a random encounter after completing either The Bloodstone Chalice for the Volkihar vampires or A New Order for the Dawnguard. Upon meeting him, two vampires will be attacking and he will be in distress, crying out "Gods, Vampires! I... I can't take this anymore! I'm not cut out for this!" It will be up to you to save him, as he pleas to you during combat, "Help me!" If he survives the encounter, he will run up to you and say that he cannot handle the stresses of vampire hunting. He will drop all of his equipment on the ground, saying "Look, take whatever you want. I'm getting out of here!" before he runs away. He will run to Frostfruit Inn in Rorikstead if he isn't killed by some random encounter along the way. 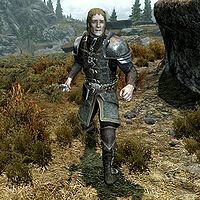 Hakar wears Dawnguard heavy armor, Dawnguard heavy boots, and an amulet of Stendarr, and he carries a simple iron dagger. The equipment he drops on the ground includes more Dawnguard heavy armor, as well as a key to Dawnguard caches and his orders. The orders state that his repeated failure as a member of the Dawnguard have demoted him to a courier and his final assignment is to refill the Dawnguard caches scattered around Whiterun. This page was last modified on 3 February 2015, at 05:41.